The following article is from Chicago the World’s Youngest City published in 1929, written by Herbert M. Johnson, Manager. Grand opera is one of the outcomes of an urge for beauty, and is one of the most potent factors in maintaining and increasing the cultural level of a community. Practically every great city of the world has recognized this from the days when grand opera became one of the major branches of musical art. Milan, Rome, Paris, London and Berlin have had their opera companies, in some cases, for generations. Chicago’s Civic Opera Company is one of the youngest, and at the same time is one of the most thriving operatic groups of the first rank in the world. Grand opera as an established institution had its beginning in Chicago in the fall of 1910, when the Chicago Grand Opera Company was organized by a group of Chicago and New York business men. 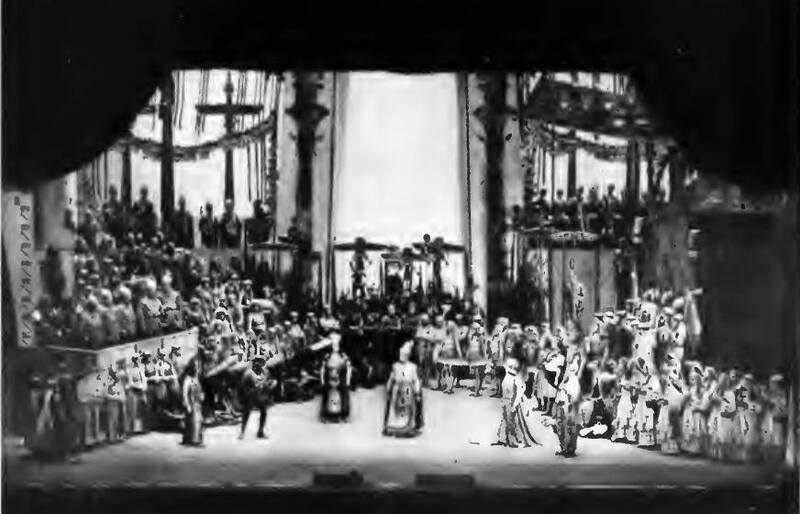 Four seasons of opera, concluding in January of 1914, were given in Chicago. After an interim of a year, the enterprise was reorganized under the name of the Chicago Opera Association. The New York backers had withdrawn and the guarantors of the Chicago company all were Chicagoans. For many years the bulk of the deficit was borne by Mrs. Edith Rockefeller McCormick and Mr. Harold F. McCormick. 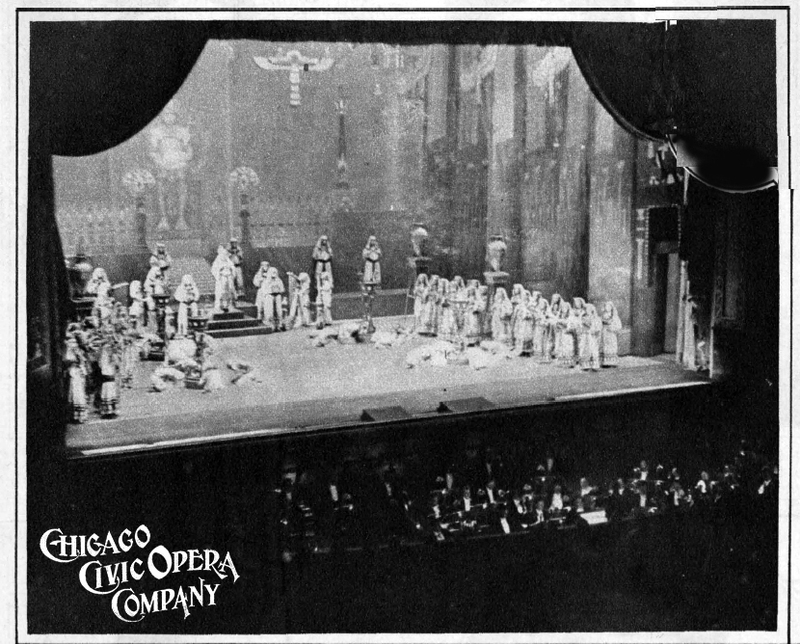 At the conclusion of the 1921-22 season, Chicago’s opera was reorganized on a basis which made a wider appeal to the community at large. 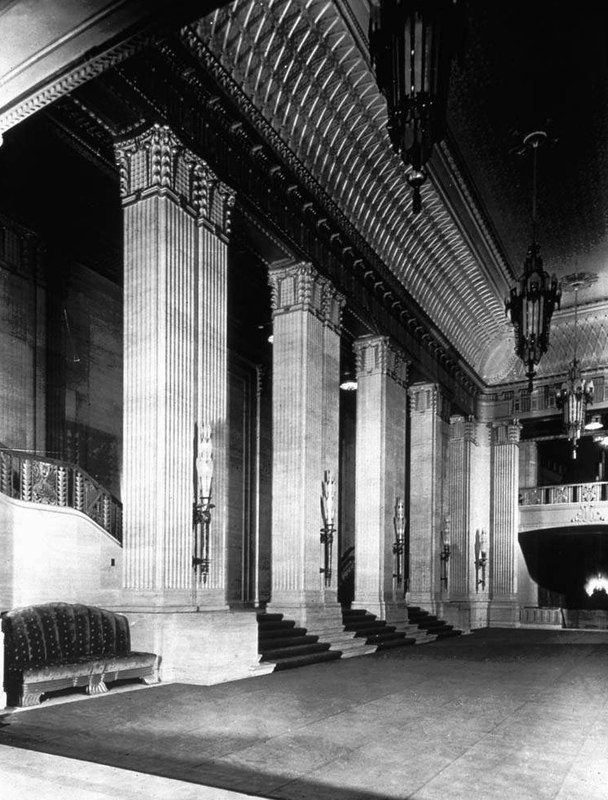 The new organization became known as the Chicago Civic Opera Company. Public spirited citizens of Chicago responded generously to the appeal for a guarantee fund; and before the season opened the company was guaranteed against loss, to the extent of $500,000 per annum for a period of five years. Probably for the first time in the history of opera anywhere in the world, a rigid budget system was followed and at the end of the season it was found necessary to call for considerably less than the total guarantee. 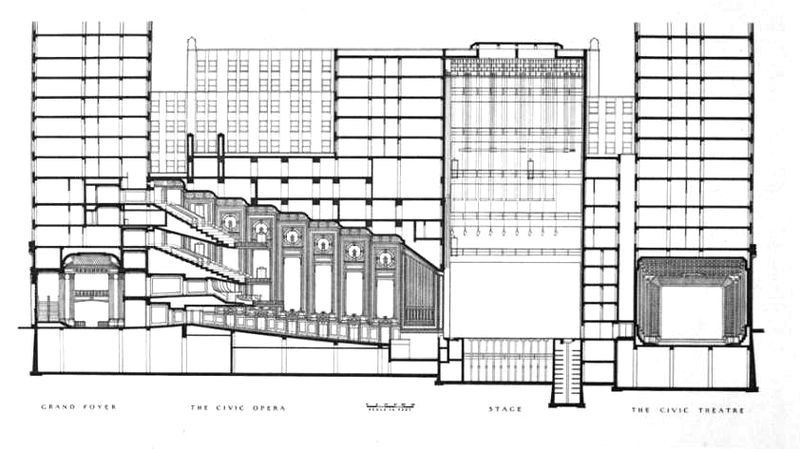 At the end of the first five year guarantee period, Samuel Insull, president of the organization, announced the plans for a new permanent home for opera to be completed in time for the 1929-30 season. The project outlined by Mr. Insull has been realized. The “20 Wacker Drive” building will house the Chicago Civic Opera Company, and provide it in years to come with a revenue that should make it independent of guarantees. The building was financed by the sale of $10,000,000 of preferred stock and a first-mortgage loan of $10,000,000 from the Metropolitan Life Insurance Company. The common stock of the “20 Wacker Drive” Building Corporation has been trusteed in the names of the present board of directors under terms of a deed of trust which will direct the trustees in a general way what to do with the trust estate. Their first duty will be to liquidate the indebtedness of the trust, over a long period so as to give them opportunity to contribute from time to time toward the expense of giving grand opera in Chicago, and with the idea of eventually carrying the whole of the burden now carried by the guarantee. On Monday evening, November 4, 1929, this magnificent new temple of music was dedicated. 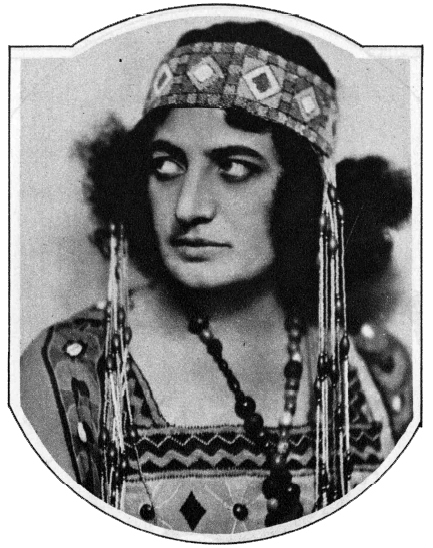 Verdi’s “Aida” had been chosen for the opening opera. For the first time in the history of the art, a great opera company now is housed in its own income-producing building. The Civic Opera Company is under great obligations to the various financial institutions that underwrote the preferred stock in the “20 Wacker Drive” Building Corporation, and to the public at large which absorbed the issue. It is under continued obligation to its guarantors who now number more than three thousand, and to the holders of season tickets, of whom there arc many thousands. Through the cooperation of these pioneers in the support of music, Chicago now possesses a civic institution, with assets in the shape of scenery, properties and other equipment; a fine new theatre and office building destined at some future date to bear the entire cost of producing grand opera in Chicago; a singing company composed of leading artists from many parts of the world; a studio and warehouse where everything required for the production of grand opera can be constructed; and a business organization which rigidly limits expenditures, to income from sale of tickets and from the guarantee fund. Crowd watches the arrival of society at first night’s performance in Chicago’s $20,000,000 opera house. Scene in Wacker Drive in front of the new building, as it appeared looking north from the elevated railroad structure at Madison street. The picture shows the double row of autos approaching the entrance by way of esplanade and the throng on the sidewalk and in the street in the shadow of the “L” structure at the right. The second floor is devoted to the making of costumes and wigs, and to storing of costumes and the great supply of trunks that carry costumes on tour. The huge stock room contains everything from a carpet tack to great rolls of Russian canvas. The laundry is equipped with all modern machinery, and a vast root on which hundreds of frames are filled with the company’s linen during the summer months. The wardrobe department works throughout the year, making new costumes and repairing old. FROM ACROSS THE RIVER, the opera building presents a magnificent picture of modern architecture. Rising to a height of forty-two stories on the western outskirts of the loop, the structure enclosing the world’s largest and finest opera house covers the block bounded by the Chicago river, Madison street, Wacker drive, and Washington street. The scenery department is one of the most interesting in this vast hive of industry. 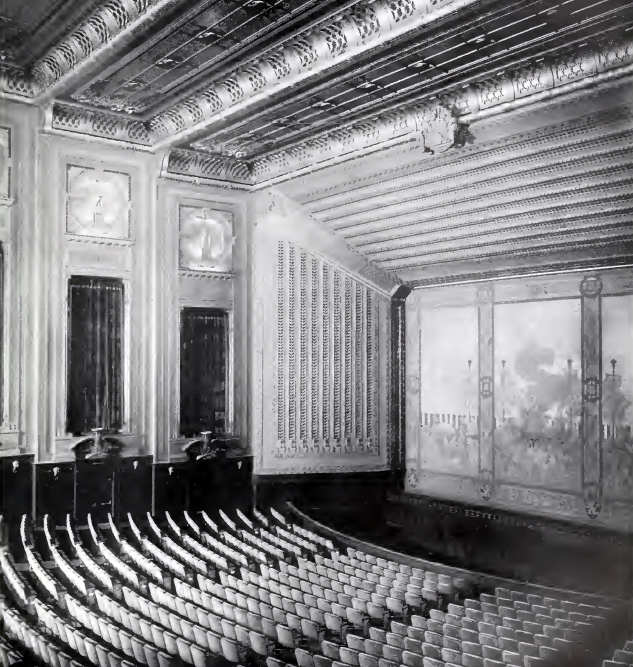 There are the studio, where designs and sketches of the settings are made; the model room, with more than a hundred models, each of which is one foot high, showing the opera stage in miniature with the scenery and lighting just as on the stage; the drafting room, where models and sketches are blue-printed so that scenery may be accurately painted on a scale of one foot to each quarter-inch on the models. There are three huge floors, seventy feet by fifty feet, on which the canvas is laid flat and painted; then there are three upright frames, seventy feet by forty-five feet, which move up and down by electricity, so painters can stand on the floor and paint without having to climb on scaffolds. Even the garage, for housing the great trucks with which the scenery is carried to and from the opera house, is located in this studio warehouse. 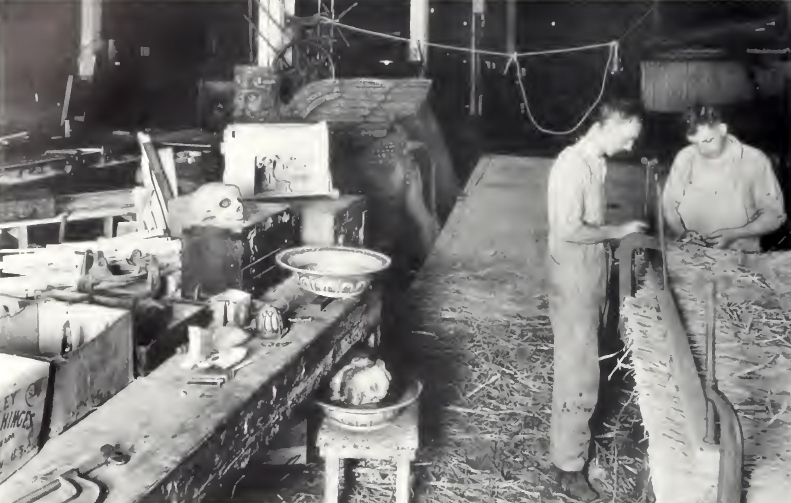 The studio and warehouse, which made it possible for the company to construct all of its own scenery and properties on a most economical basis, came into being in 1924, to avoid the exceedingly heavy expenses of warehousing in various parts of the city and to concentrate the transportation and trucking activities in one building. With the storage space available in the new theatre added to that of the studio warehouse, the Chicago Civic Opera will be able to store practically all of its scenery, properties and equipment under its own roofs. The studio was financed by means of a bond issue, and the bonds are being retired rapidly. As soon as they have been fully paid, the studio will represent a net saving of $80,000 a year. Of The constructive work of the opera company never ceases. Every working day in the year the warehouse is in operation, for the building of properties, scenery, armor, wigs, costumes and electrical apparatus; for repairing, laundering and all the far-reaching mechanical work that is the essential foundation for the magnificent illusions of grand opera. Each department is distinct. 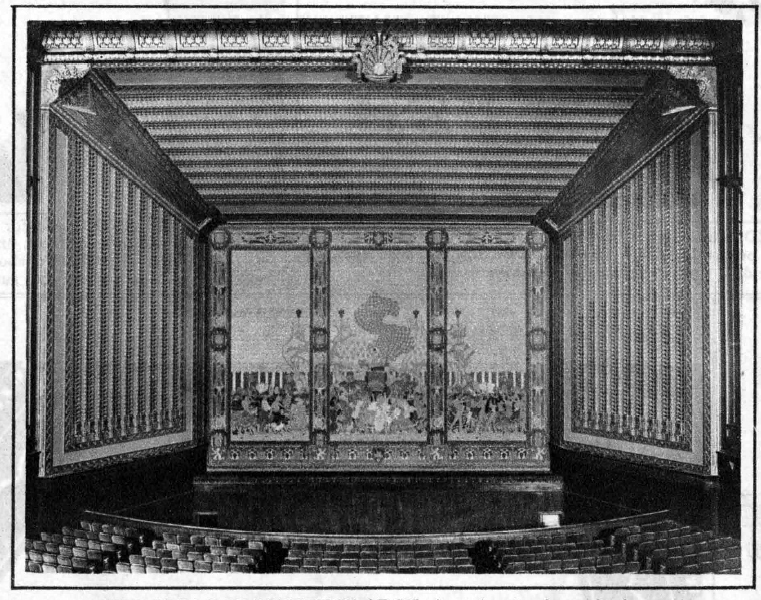 THE GREAT PROSCENIUM ARCH rises sheerly above the lowered, orchestra pit, with narrowing angle. that lead the eye to the ninety-foot steel curtain. The grilled bronze of the arch conceals heavy organ pipes. Every year the Chicago Civic Opera makes a post-season tour which is one of the most important enterprises in advertising the cultural side of Chicago. In the last seven years the company has visited forty-two cities and given 390 performances. During that period, literally millions of pieces of advertising literature have been distributed, and the press clippings collected might be measured by the rod. THE AUDITORIUM as it appears from the stage. It seats a total of 3,600 persons; 1,700 on the main floor, 850 each In balcony and gallery, and the remainder in the thirty-six boxes. The balconies are reached by elevators. 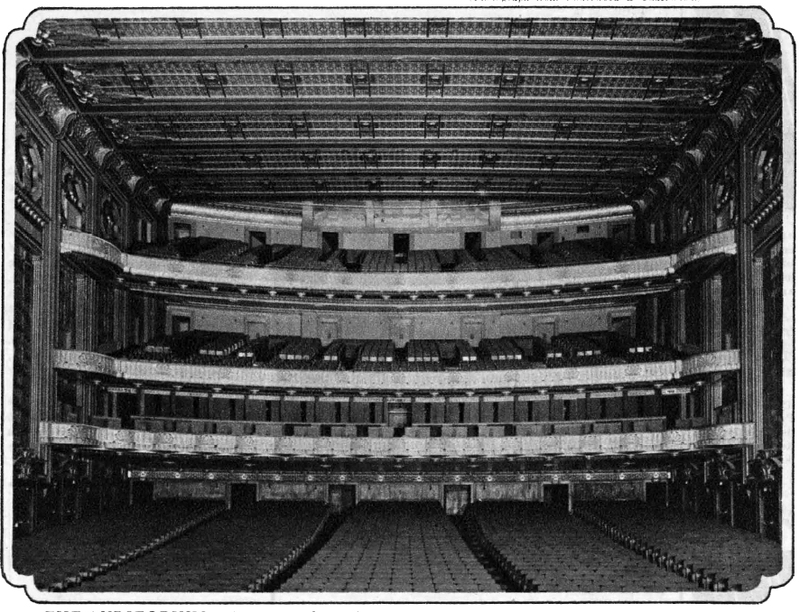 With the year 1929, the Chicago Civic Opera enters a new and vastly important held—that of training future material for the operatic stage. Six European scholarships have been endowed by members of the board of trustees, and will be available to Chicago artists ready for their post-graduate work and debuts on the operatic stage. The first annual scholarship contests were scheduled for September and October of this year. 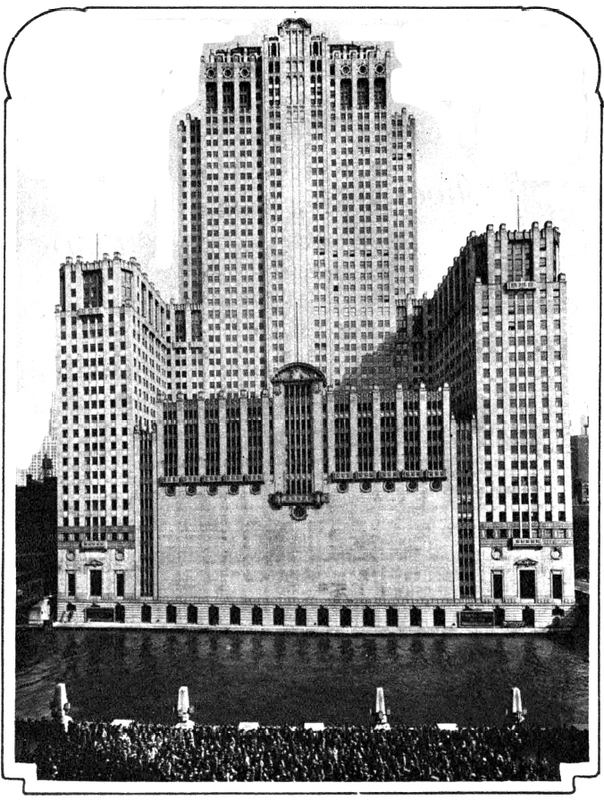 On September 30, 1929, the Chicago Civic Opera opened its ballet school, under the direction of Laurent Novikoff. This school is destined to play an important role in the training of dancers. While it is intended primarily to provide new blood for the Civic Opera Ballet, its courses will include also plastic and dramatic dancing and playground work; and it is the hope of the management that the school will become an important art force in the community. For future years, both a chorus school and an orchestra school are envisioned. Opera in Chicago is at last on a secure basis. The credit for the achievement belongs entirely to the broad-minded civic leaders whose wise foresight and generous donations made the institution possible. 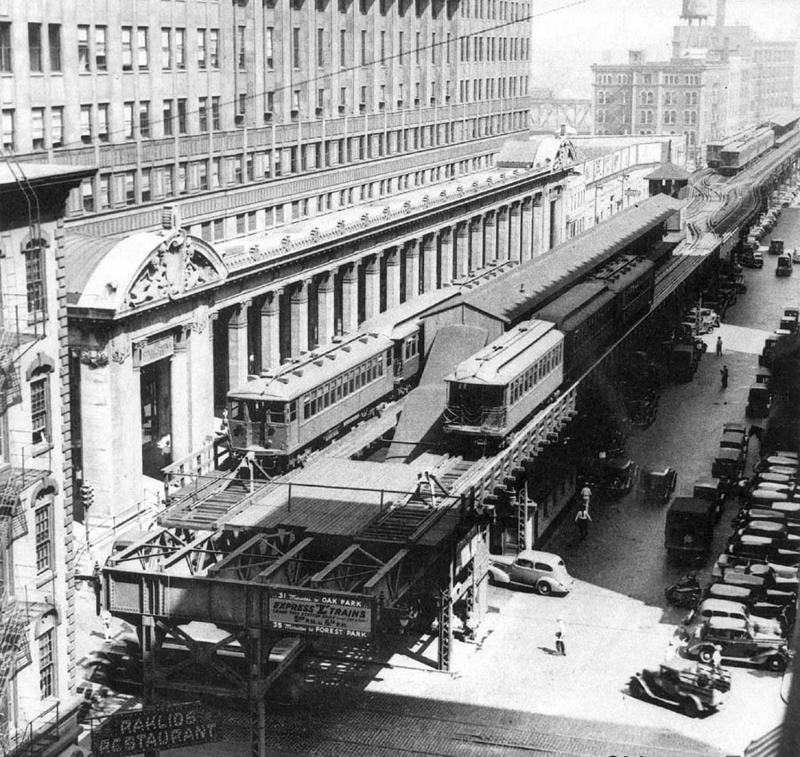 Market Street stub terminal looking north in 1930. 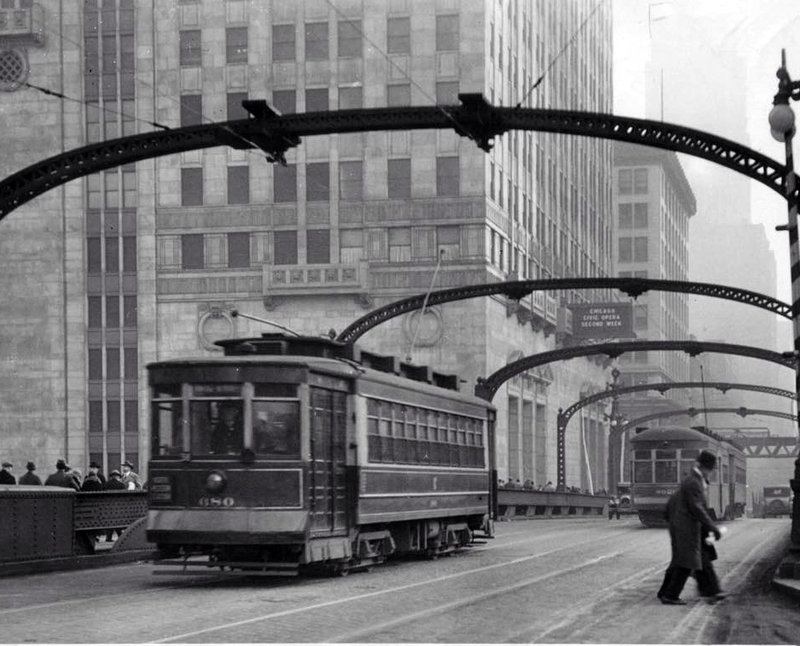 When it was built, Market Street was industrial; by this point, it stood in front of Chicago’s new Civic Opera House. The station had a single island platform between two pocket tracks with a crossover at the north end of the station. Note the sign on the end of the structure advertising express trains to Oak Park and Forest Park. THE NEW GOLDEN HORSESHOE blazed with jewels and a shimmering rainbow of color last Monday night as the Chicago Civic Opera presented the spectacle of its house warming party. It was a premiere of magnificence altogether ~ fitting for the world’s largest and finest opera house. AIDA’S SPLENDORS unfolding themselves upon the stage at the first performance in Chicago’s new opera house. This festival creation was a choice at once happy and of good augury; Aida inaugurated the first season at the Auditorium nineteen years ago, and was the first performance of the Civic Opera company in 1922. 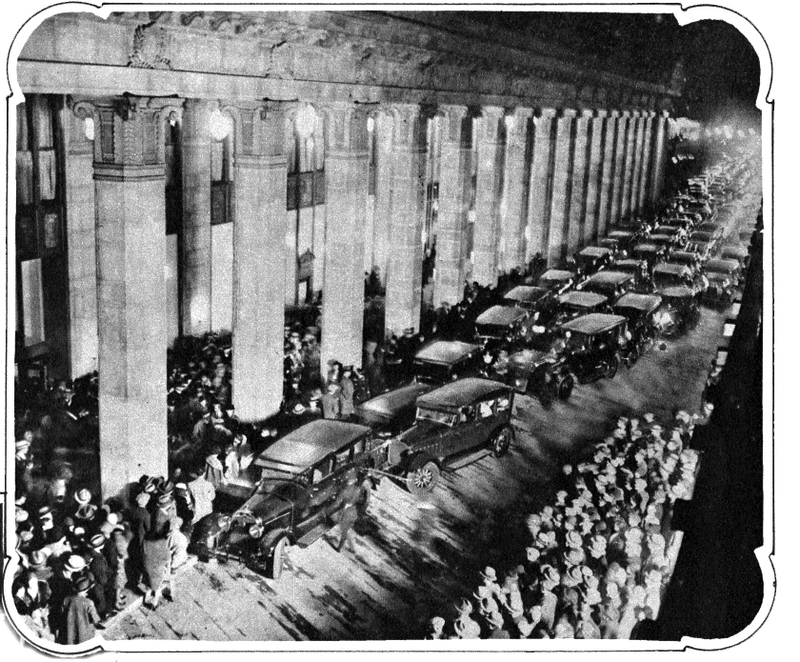 Opening night of the Civic Opera House, Monday evening, November 4, 1929. IN THE HISTORIC OPENING of Chicago’s new opera palace tomorrow evening, Rosa Raisa will have the honor of singing the principal soprano part. She will have the role of Aida, for which she is costumed here, in Verdi’s opera of the same name, a spectacular and impressive work which has served many times to usher in operatic seasons. THE scenes change quickly when you visit the Kemper Insurance building, 20 N. Wacker dr., formerly the Civic Opera building, the last big real estate venture of the late Samuel Insull. There’s the workaday world of business. With 745,000 square feet of office space, occupied by a variety of “blue chip” companies, the building is the fourth largest office skyscraper in Chicago. And for a view of today and tomorrow, take an elevator to one of the upper floors and look out over Wacker drive, the fastest developing street in downtown Chicago, and the near west side where city planners are projecting many new public and private developments. But the depression and the crash of Insull’s utility empire intervened. Office buildings were piling up some tidy deficits of their own. General Finance corporation acquired the property in war time 1943 and five years later sold it to Lumbermens Mutual Casualty company, a member of the Kemper Insurance Group, for $10,735,000. The Kenper companies, whose principal offices are at 4750 Sheridan rd., have the 38th floor and parts of the 9th and 10th. The U-shaped building, designed by Graham, Anderson, Probst & White, occupies the block bounded by Wacker, Madison and Washington streets, and the Chicago river. At the Madison-Washington corner once stood the old Central Union block, the first brick building built and occupied in the burned district after the fire of 1871. 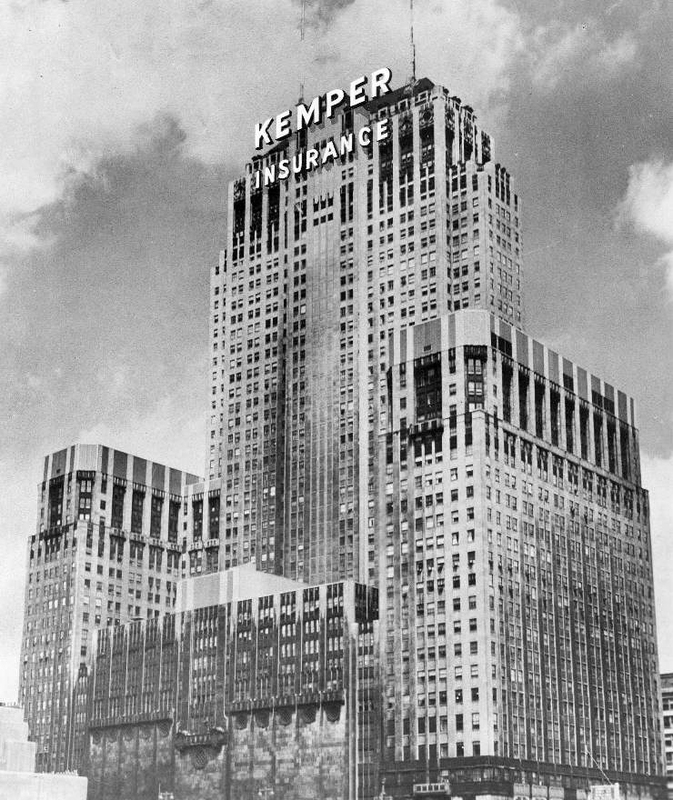 Home of business and opera, the Kemper Insurance building “discovered” Wacker drive back in the late ’20s. Many new buildings have followed it there since World War II. Counting the three floors under the peak roof, the building rises to a height of 45 stories. Its exterior is largely Indiana limestone and its most impressive exterior feature perhaps is the 400 foot long colonnade along the Wacker side. The architects did an excellent job in not penalizing the office portion of the building with the opera house complement, said John W. Arthur, executive vice president and general manager of the building corporation. 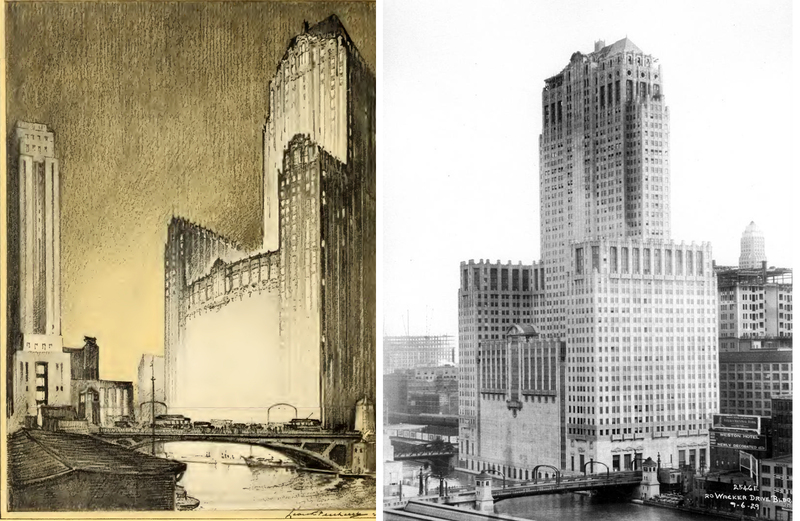 The building has been particularly successful in attracting offices of large corporations, including Pick Hotels corporation, American Telephone and Telegraph company, Marquette Cement Manufacturing company, Cities Service Oil company, and Standard Oil company (Indiana). THERE are two TV transmitter towers—NBC and ABC—on the roof. Both networks also have transmitter facilities in the building, NBC on the 42d and ABC on the 44th in a space where Insull once had an apartment. On the 39th is the plush Tower club, formerly the Electric club. Commonwealth Edison company has a substation—in the subbasement of course. The building produces more heat than it uses, selling the surplus steam to nearby buildings on Madison street. It is served by 33 elevators which, since the building opened, have traveled up and down a total of 31? million miles. In recent years the building has been completely air conditioned. 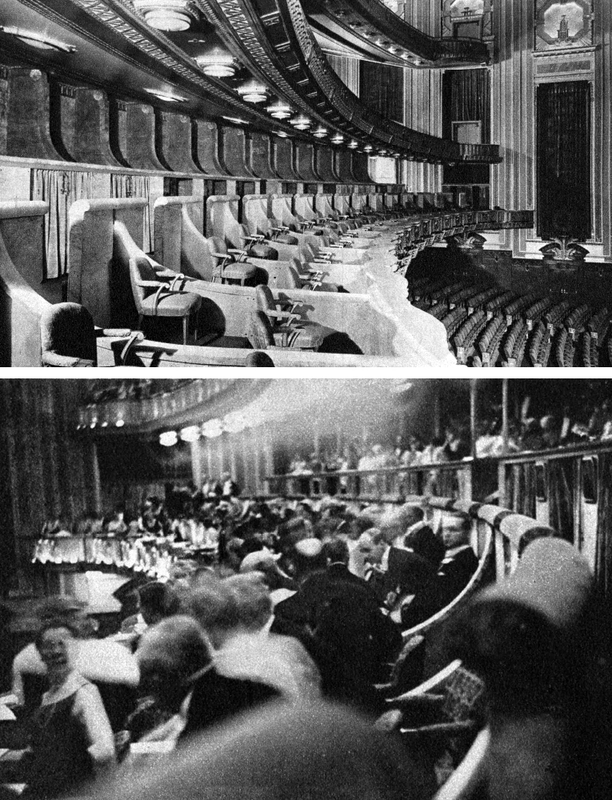 The 3,531 seat opera house is in use about a third of the time, for opera, other entertainment, and meetings, Arthur said. The stage has an area equivalent to the total floor space of nine average homes. The seating portion of the theater goes up seven floors and the stage 13 stories. Until about a year and a half ago the Civic theater served as ABC’s TV studio. It is being prepared now for legitimate theater use, said Arthur. Fascinating history which I never knew until today, thanks to the internet. Chicago was my boyhood home and I only experienced the Civic Opera House , first, as a child seeing “Super Circus” telecast live on Chicago’s Channel 7, WBKB-TV, and then—not opera—but two Howard Miller (a famous Chicago DJ on WIND) rock ‘n’ roll shows as a teen! My last experience with the Civic Opera House was when working at Chicago’s Channel 32. Though its offices were at Marin City WFLD-TV originally maintained its studios atop the Civic Opera House and I had occasion to be there. In all that time I never knew the venerable building’s history. Like so many of the FINER buildings in Chicago (unlike some of what is built today, sadly) the Civic Opera House is more of a monument, and not even 100 years old. May its tradition long continue!